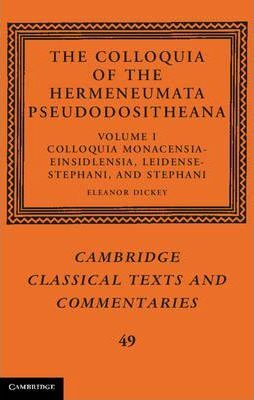 The Colloquia are manuals written to help ancient Greeks and Romans get around in each other's languages; they contain examples of how to conduct activities like shopping, banking, visiting friends, hosting parties, taking oaths, winning lawsuits, using the public baths, having fights, making excuses and going to school. They thus offer a unique glimpse of daily life in the Early Roman Empire and are an important resource for understanding ancient culture. They have, however, been unjustly neglected because until now there has not been any modern editions of the texts, no translations into any modern language, and little understanding of what the Colloquia are and where they come from. This book makes the Colloquia accessible for the first time by combining a new edition, translation and commentary with a ground-breaking, comprehensive study of their origins. It is clearly written and will interest students, non-specialists and professional scholars alike. 1. Introduction; 2. Colloquia Monacensia-Einsidlensia (ME); 3. Colloquium Leidense-Stephani (LS); 4. Colloquium Stephani (S); 5. Appendix: comparison of capitula sections; Bibliography; Concordance with earlier editions; Index. Eleanor Dickey is Associate Professor of Classics at the University of Exeter. She has published widely on the Latin and Greek languages and the ways they were studied in antiquity, including Greek Forms of Address (1996), Latin Forms of Address (2002) and Ancient Greek Scholarship (2007). She also has extensive experience of teaching elementary languages, both Greek and Latin, and has brought to bear on her understanding of ancient language-teaching materials both that experience in general and specific tests of the Colloquia on modern students.